Avery is doing fantastic 7 days after his heart surgery. Thanks to everyone for their prayers and support! Well, it's 4 o'clock in the morning and since I can't sleep, I decided to send a quick update to everyone. First of all, Sheri, Luke, Avery, and I would like to thank everyone for their prayers and words of support!! Avery's surgery went absolutely fantastic!! He was such a little trooper. He didn't even shed a tear. They gave him some Versed about a half hour before he had to go in, so he was a little loopy. He fussed more when we had to pull him away from a Scooby Doo cartoon than when the anesthesiologist took him away from mom and dad! He was in surgery for approximately four and a half hours. 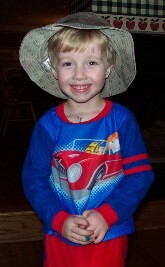 They removed his band and opened up his right atrium to patch the hole between his ventricles. 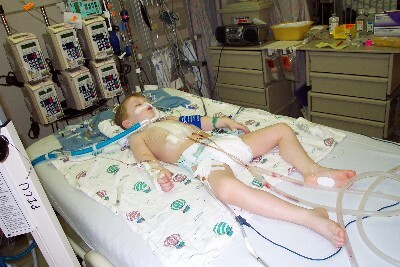 They thought it would be less stressful for him if they could fix it from there rather than to open his right ventricle. Both the doctor and the surgeon said the hole was huge! The surgeon made a circle with his fingers to describe it and it was about the size of a quarter. Fortunately, they were able to patch the hole and it seems to be holding up well. There was some leakage in the smaller atrial holes we were concerned about. But so long as this doesn't increase, he should be able to handle it just fine. Recovery seems to be moving ahead of schedule. He kind of freaked us out when he opened his eyes and was very responsive only a couple hours out of surgery. He's such a little fighter that the knock-out drugs aren't being as effective as they should be. He lifted both his hands up to see needles and tubes protuding from each limb and had a look like "What the hell is going on here?" He then pointed to the TV. I said, "Do you want to watch Scooby Doo?" He nodded yes, watched for a moment, and then fell back to sleep. He's scheduled to be taken off the respirator Saturday morning which is a day or two ahead of schedule. I have no doubt he's going to be running around and ready to beat on his brother again very soon. Thanks to everyone for the prayers!! Once again, I think they really helped us out!! Well, it's that time again. Another surgery for the Swank Family. It's Avery's turn. This will be operation number 11 since our boys were born. On Friday, March 21st, Avery will step up to the plate to deal with some unfinished business he has with the wonderful surgeons at Children's Hospital. Many of you may recall that our twin sons, Luke and Avery, had their first surgeries on the same day when they were 6 months old. At the time, they both had bands placed around their pulmonary arteries to slow blood flow out of their hearts. This was a temporary fix so they could grow with the hope that the bigger they could get, the easier it would be for the surgeons to correct their heart defects. While Luker has been having all this "fun" over the past 3 years, Little Avery has been fortunate to avoid serious medical challenges. He did have to wrestle the scalpel for a pyloric stenosis and hernia in that time, but no challenges as big as his brother. That's going to change this Friday. The time has come to remove Avery's band. We'd hoped that the holes in his heart would grow shut as he grew bigger, but we weren't quite that lucky. So they will go in and remove his PA band and perform open heart surgery on him to patch up the large hole between his ventricles. Of course, it wouldn't be a Swank surgery if there wasn't a wild card in the mix. Avery also has a small hole in the lower part of his heart that may be difficult to get to via surgery. Our hope is that this hole will not cause problems for him which would require an additional procedure, but we won't know for sure until the large hole is repaired. So this is where we turn to our friends and family. When Luke went to the edge of life in December of 1999, I'd sent an email out to a bunch of friends asking for people to say prayers for him. Long story short (too late) we ended up having literally hundreds of people from all over the world saying prayers for him. I truly believe that this helped bring Luke home to us. Now I'm hoping for the same thing for Avery. If you get the chance between now and Friday at 8:30am, please say a quick prayer asking for guidance for the doctors and strength for Avery. If prayer isn't your thing, maybe you could just send a positive thought his way. My family and I would really appreciate it. I'll send you all an update with Good News the first chance I get after the surgery is done.